The success of your business is creating a platform from which consumers make a lifestyle choice. Visual Merchandising will set you apart from other lacklustre businesses that fail to visualise sales opportunities and maximise the sales benefits of using space correctly. We can help you with all aspects of retail graphics including: store dressing, window displays, backdrops, display units, hanging banners, floor and shelf talkers, wayfinding which can and should all be used cohesively to add to the customer experience and maximise your brand impact. 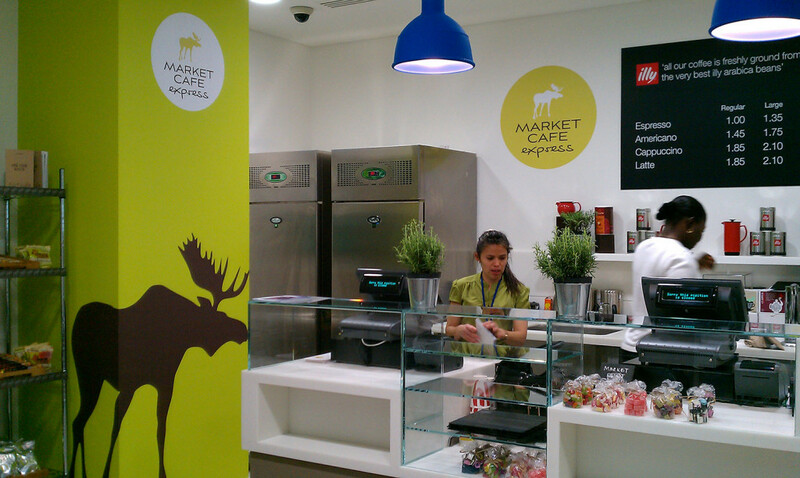 Looking for inspiration for your retail space? 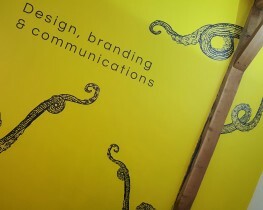 Take a look at some our recent retail graphics and retail transformations. 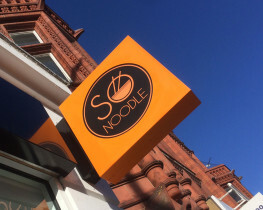 Our lovely friends at So Noodle asked us to produce some new signage for them as they take their restaurant to the next level. 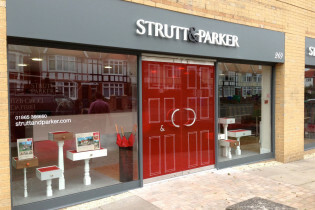 Strutt & Parker were in a fix. Part way through a new shop fitting, they were let down by their original graphics team, and asked us to come to the rescue, in double quick time. 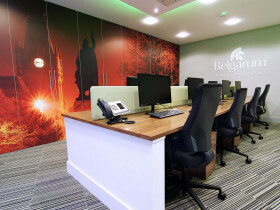 Branding the new luxury offices of Belgarum Estate Agents in WInchester, we wrapped the storage wall to bring a not so little piece of Winchester into the space. Here we have a collection of some of the smaller jobs which prove that you don't have to lay out the big bucks to make a big impact. 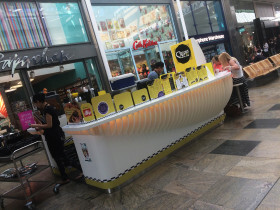 Everyday is pancake day at West Quay! "Lets get rid of the stick on labels and the paper menus….its time to look the business!" 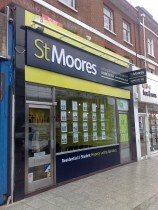 Remove existing, make good and install new shop front and signage. Asda helps folk kick the habit! 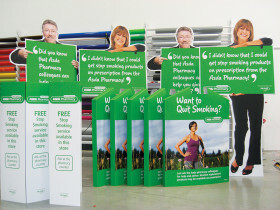 We produced a mini run of promotional items for Asda stores in a joint initiative with McNeil Healthcare to encourage people to quit smoking and get healthy. 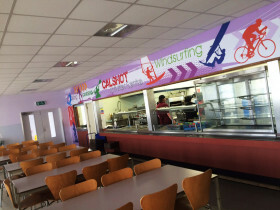 We were asked by HC3S to produce and install wall graphics for their newly refurbished cafés at Calshot Activity Centre. 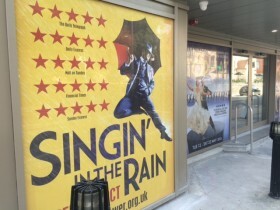 With a host of new shows arriving to the Mayflower we were asked to install contravision vinyl on their front windows. 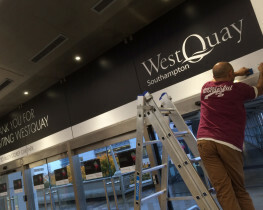 With the addition of the new bridge link on Level 7, we were asked by WestQuay and Ikea to implement signage designed to engage visitors and guide them from one to the other. 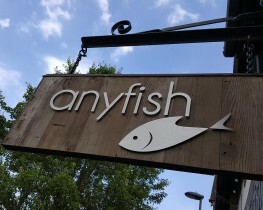 Using reclaimed timber for the fascia and swing sign to give it some beachy, driftwoody type soul, we added some shiny stainless steel to add some whizz-bang to this shop front for a fishmonger. This is another quick overview of some of the day-to-day smaller jobs we do for our lovely customers.